Join the South West Songbirds for a candlelit evening of Christmas music, including traditional carols and well-known favourites at St Andrew's Church, Garratt Lane, Earlsfield SW18 4SR on Thursday 6 December 2018 at 6.30pm. 11th December, St Andrew's Church, Garratt Lane, Earlsfield. 7th July, St Andrew's Church, Garratt Lane, Earlsfield. 17th December 2015, St Andrew's Church, Garratt Lane, Earlsfield. 25th June 2015, St Andrew's Church, Garratt Lane, Earlsfield. 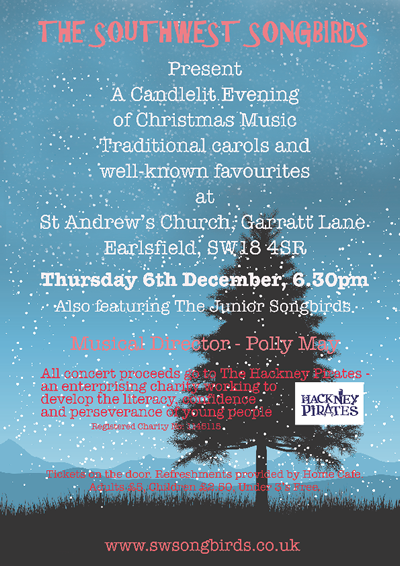 12th December 2014, 6.30pm, St Andrew's Church, Garratt Lane, Carols by Candlelight. 8th July 2014, St Mary's Church. 29th March 2014, St Andrew's Church, Garratt Lane, 7.30pm. Music from Mozart, Faure, Rutter, Chilcott and U2, to name a few.